Crows often appear in groups, and though there seems to be no variation in their cawing to each other, each caw actually has a different meaning. Their complex vocabulary is one sign of their intelligence, and is also a sign of their significance as power animals. When a crow explores something new, others watch closely to see what happens and then learn from it. They often make great noise when hunters are around, warning deer and other birds. Crows recognize potential danger and hence always post lookouts when feeding. This is their most vulnerable time. This helps us understand that we must watch what we believe, to test our habitual ideas about reality against a more universal standard. Without paying careful attention, we are unable to understand the language of crows, this signifies the fact that we can't always see beyond our own cultural limitations. These limitations include certain moral codes of right and wrong, along with 'rules' that accompany these codes. Throughout history there have been many (unnecessary) conflicts and wars between humans due to differing moral and religious beliefs. To truly create a new age of love, peace and harmony it is of high importance for us to be able to transcend our particular cultural limitations and to hold in our hearts and souls what we share as spiritual beings in human form. We are all connected, infinitely and composed of the same 'stuff'. We need to realise that hurting others only hurts ourselves. Crow is the bird which represents this transcendence. 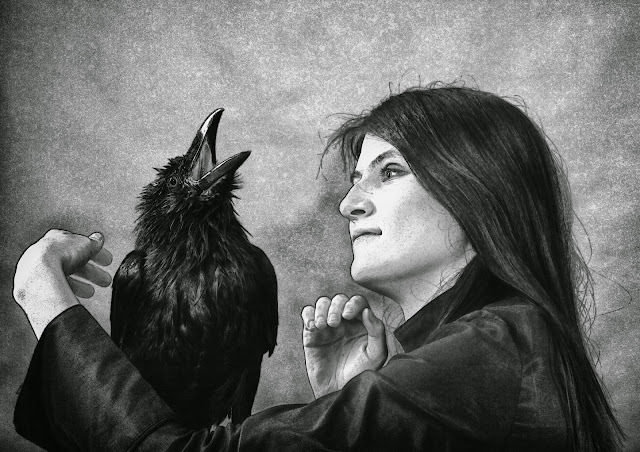 Crow can also teach us to be mindful about judging people automatically. Be mindful of your opinions and actions. You need to walk your talk, to speak your truth and to know your life's mission. Again, trust your intuition and personal integrity, to create your own standards, whether or not they match those of the world around you. Be an individual, think for yourself, don't necessarily follow the crowd! In the courting process the male crow's voice takes on a singing quality. This lets us see what the basis of sacred law is, unconditional love, the one unfailing principle by which we can test our own principles. Crows are messengers, telling us about the creation and magic all around us, that is available to us just for the asking. Look for opportunities to bring into being the magic of life. The striking black color of the crow represents the color of creation. It is the womb out of which the new comes into existence. Black is the color of the night, giving birth to the light of a new day.